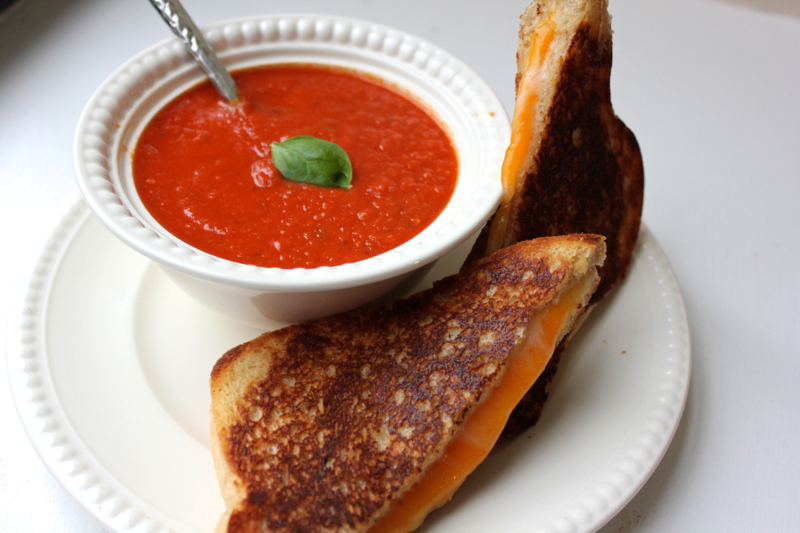 Grilled cheese and tomato soup have been a winter craving for us since I packed them for a Valentine’s Day picnic several years ago, in the snow, to watch the planes come in and out of the airport. Back then, “making” tomato soup consisted of opening a can of Campbell’s. My tastes have evolved since then, but I hadn’t attempted to make my own tomato soup, so we went without. Our period of deprivation has ended just in time for this year’s snowy season and the onset of our cravings. 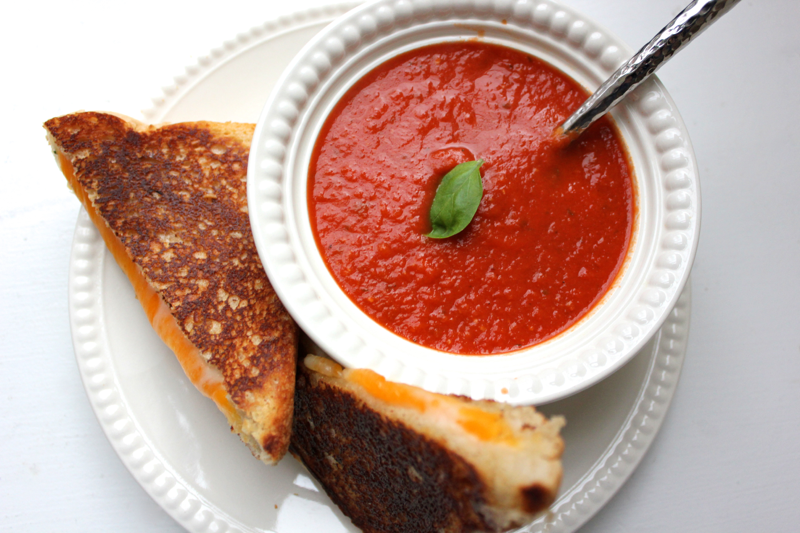 This tomato soup recipe is simple, delicious, and perfect for dunking a melty grilled cheese. To make the soup, dice 1 small onion, mince 2 garlic cloves, and sweat them in olive oil in a pot. 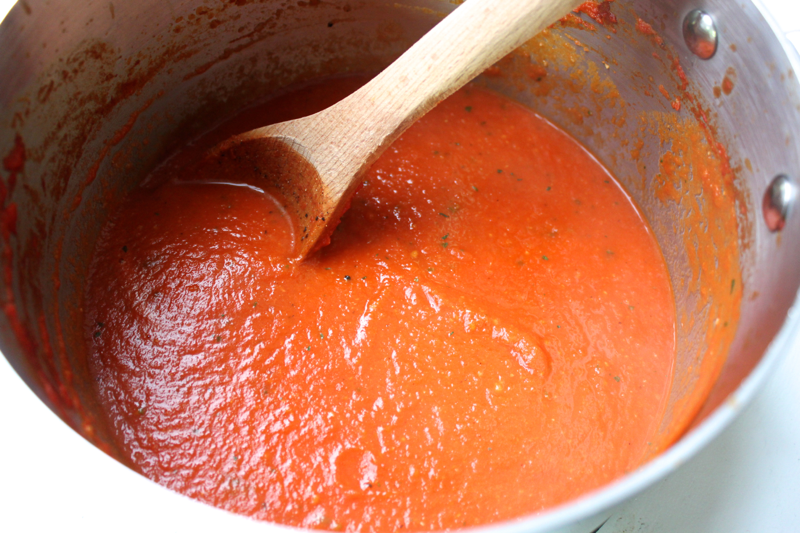 Once they have softened, pour in some canned San Marzano tomatoes. A 28 ounce can yielded 3 bowls of soup, so use 2 cans if you’re feeding more people. 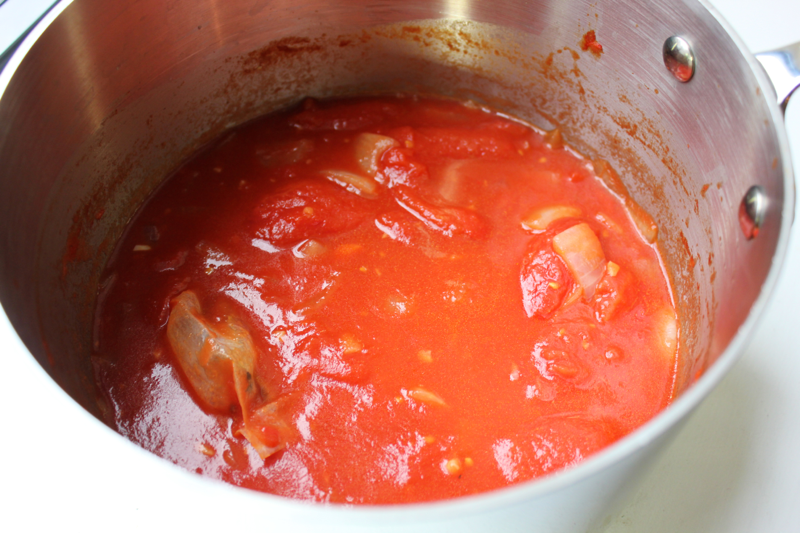 Add enough chicken stock to the pot to loosen things up (about 3/4 cup per 28 ounce can of tomatoes). Using a refillable tea bag or cheese cloth and twine, package 1 bay leaf, some basil stems, and some peppercorns. Add the aromatics to the pot, along with some salt. 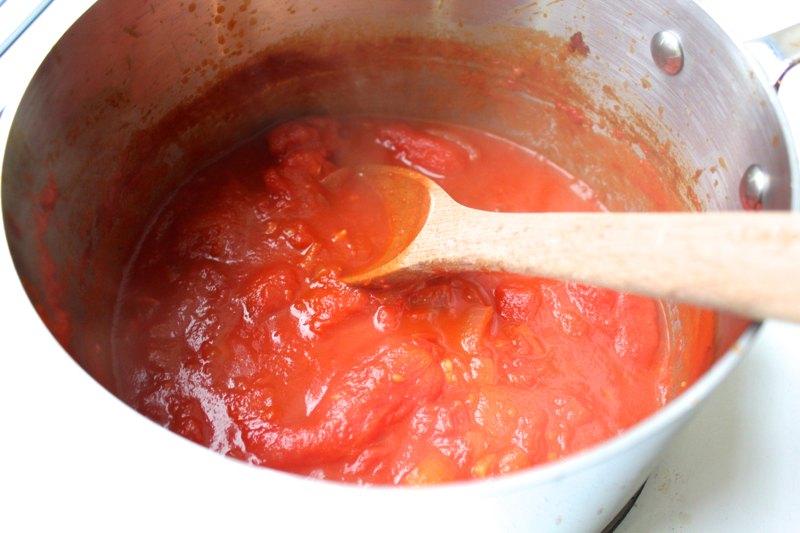 Let the tomato soup simmer for about 20 minutes until the tomatoes are soft and easily pierced with a fork. Remove the satchel of aromatics from the soup. Then, blend the soup using either an immersion blender, like I did, or a regular blender. Once the soup is puréed, add in about 1/3 cup of milk or cream, more salt to taste, and a few basil leaves. Blend the soup again to combine everything. Taste it, and adjust accordingly. Portion out the soup and serve it alongside your favorite grilled cheese. This soup is just made for dunking, but don’t think it was neglected after the grilled cheese was gobbled. I slurped it right up. This is a meal that makes me feel warm and cozy, and I hope it does the same for you!